National Council of Hotel Management Joint Entrance Exam (NCHM JEE) 2017 has begun on April 29 for offering admissions to 55 participating institutes including 14 private, 21 central government, 1 public sector undertaking and 19 state government institutes of hotel management. A total of 8124 seats will be allocated by National Council for Hotel Management and Catering Technology (NCHMCT) to eligible and qualified candidates in B. Sc. programmes. Around 20,000 candidates are expected to appear across 33 exam cities. The entry inside examination centres started at 9 am, and the 3- hours exam began at 10 am. NCHM JEE 2017 is an offline mode exam, which is being held in paper-pencil pattern. The question paper is available in English and Hindi, except for the questions of English language section. 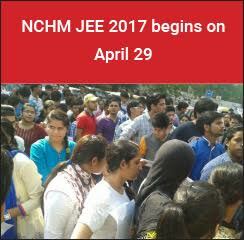 The NCHM JEE 2017 is divided in 5 sections – Numerical Ability & Scientific Aptitude, Reasoning & Logical Deduction, General Language & Current Affairs, English Language and Aptitude for Service Sector. As per the marking scheme, the paper carries a total of 200 objective type questions. For each correct answer, the candidate will be awarded 1 mark and for each incorrect response, there will be a deduction of 0.25 marks. Result of NCHM JEE 2017 will be declared in third week of May by National Council of Hotel Management and Catering Technology (NCHMCT). Online registration and choice filling will start from May 29 and will continue till June 9. Stay tuned to www.hospitality.careers360.com for more news and updates on NCHM JEE 2017.